Schools Matter: Didn't dullard Duncan say Katrina was the best thing to happen to New Orleans? Didn't dullard Duncan say Katrina was the best thing to happen to New Orleans? 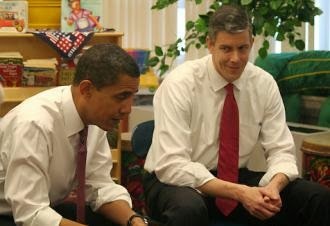 The absolute worst education President, and Secretary of Education in U.S. history. A new report released this week finds that the drastic growth of overinvestment in charter schools and underinvestment in oversight has left Louisiana’s students, parents, teachers and taxpayers at risk of academic failures and financial fraud. The report, “System Failure: Louisiana’s Broken Charter School Law” cites billions of taxpayer dollars plunged into charter schools since Hurricane Katrina hit, including over $831 million in the 2014-15 school year alone. Since 2005, charter school enrollment in the state has grown 1,188 percent. The Louisiana Department of Education’s Recovery School District, originally created to facilitate state takeover of struggling schools, is now the first charter-only school district in the country. 1. Oversight depends too heavily on self-reporting by charter schools or the reports of whistleblowers. Louisiana’s oversight agencies rely almost entirely on audits paid for by the charters themselves and whistleblowers. While important to uncover fraud, neither method systematically detects or effectively prevents fraud. 2. The general auditing techniques used in charter school reports do not uncover fraud on their own. The audits commissioned by the charter schools use general auditing techniques designed to expose inaccuracies or inefficiencies. Without audits specifically designed to detect and uncover fraud, however, state and local agencies will rarely detect deliberate fraud without a whistleblower. 3. Inadequate staffing prevents the thorough detection and elimination fraud. Louisiana inadequately staffs its charter-school oversight agencies. In order to carry out high-quality audits of any type, auditors need enough time. With too few qualified people on staff—and too little training for existing staff—agencies are unable to uncover clues that might lead to fuller investigations and the discovery of fraud. 4. Underinvestment in systems that help struggling schools succeed. Lawmakers and regulators have invested in systems that set high standards and then close schools that fail to meet them, rather than helping them improve to meet the standards. This investment in a severe accountability system does not support schools achieve academic success. 5. Heavy reliance on data that is vulnerable to manipulation. The state’s academic oversight system relies largely on sets of data that can be manipulated by regulators, authorizers, or the charters themselves. Without reliable data, schools, parents and the public have no way to accurately gauge academic quality at their schools. Since 2005, approximately $700 million in public tax dollars has been spent on charter schools that currently have not achieved a C or better on the state’s grading system. As the state has insufficiently resourced financial oversight, it has failed to create a structure that provides struggling schools and their students with a pathway to academic success. Coupled with an unwillingness to help failing schools succeed, the rapid growth of charters has failed Louisiana children, families and taxpayers. The report calls for a set of core reforms to end the hemorrhaging of public funds to fraudulent charter schools and also calls on state and federal lawmakers to put systems in place to prevent fraud, waste, abuse and mismanagement. To address the serious deficiencies in Louisiana school districts, the Center for Popular Democracy and CCS suggest mandating new measures designed to detect and prevent fraud, increasing financial transparency and accountability, redesigning the data collection process, and redesigning the system to support struggling schools. The Center for Popular Democracy is a nonprofit organization that promotes equity, opportunity, and a dynamic democracy in partnership with innovative base- building organizations, organizing networks and alliances, and progressive unions across the country. Coalition for Community Schools New Orleans (CCS) is a New Orleans alliance of parent, youth and community organizations and labor groups fighting for educational justice and equity in access to school resources and opportunities.